Talking Dog: Puppy in viral video can baby talk! 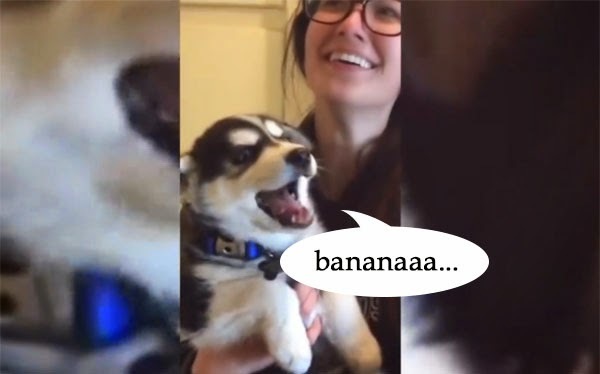 Home / news / video / viral / Talking Dog: Puppy in viral video can baby talk! A cute puppy is taking the internet by storm. And it's not just an ordinary dog that barks, it knows how to baby talk! Watch this viral video. The 30-second clip, which shows an amused owner carrying the talking dog, already got more than 25,000 shares, 18,000 likes and over 1.1 million views on Facebook alone as of 9:30 a.m. today. In it, the adorable domestic animal sounded like it was saying banana. There's also a portion in the video that it was talking like a baby when the mother dog tried to reach to show affection. Talking dogs aren't unusual. There are hundreds if not thousands of videos on YouTube that feature its one-of-a-kind talent to utter words like a baby, this is one of the cutest and funniest though.